This publication combines several papers resulting from a conference held at the British Institute of International and Comparative Law in 2003. Tom Barkhuysen and Michel van Emmerik provide a comparative view on the implementation of judgments of the European Court of Human Rights (ECtHR) within the national legal orders of various Member States and assess what improvements are required. Murray Hunt outlines the State?s obligations flowing from a judgment of the ECtHR within the context of the wider international law framework governing the legal consequences of internationally wrongful acts. Ed Bates charts the supervision of the execution of judgments delivered by the ECtHR and the challenges facing the Committee of Ministers. Piet Hiem van Kempen discusses a framework for a national post-trial procedure for redressing violations of the ECtHR in criminal cases. 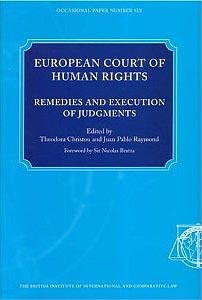 "European Court of Human Rights: Remedies and Execution of Judgments"